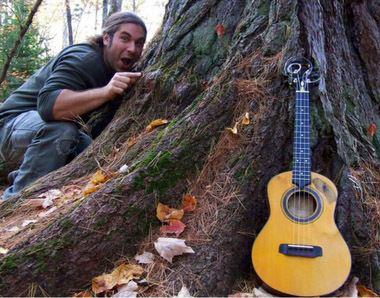 Although he hails from the edge of civilization in interior Alaska, Russ is a favourite with Aussie festival audiences. Ukulele Russ, known for his off-the-cuff antics and fast hands, has carved out his niche and proven to the masses that the ukulele is stringed testosterone in the hands of the right man. The self-certified only full-time ukulele player in Alaska, Russ Copelin has created a uniquely entertaining act that combines original songs that tell stories of living in Alaska and his own unique takes on popular songs and classic standards. From rock’n’roll to funk, bluegrass to hip-hop, Russ takes the ukulele into uncharted waters. Sprukesters can catch Russ at the Friday and Sunday concerts, master classes and chillin’ around the festival all weekend. Russ has had the pleasure of opening for such great acts as; Bill Maher, Primus, Dead Season, The Derrel Gleason Trio, Sweating Honey, Michael Stevens Harmonica Virtuoso, Victoria Vox, among others! Currently he is Alaska’s only internationally touring full time ukulele guy and continues to traverse the globe bringing alternative ukulele music to the people. Ukuleles do not have to sound happy. It is all in the operator and Russ is taking the ukulele into uncharted waters.